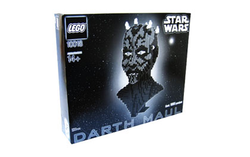 10018 Darth Maul Bust is a Star Wars Ultimate Collector's Series set released in 2001. It contains 1860 pieces. This set was retired in 2002. This is a description taken from LEGO.com. Please do not modify it. Darth Maul lives again! Facts about "10018 Darth Maul Bust"
Darth Maul lives again! Darth Maul lives again in this striking bust, perfect for display in your home. The Dark Lord of the Sith makes a menacing model and a great addition to any Star Wars collection. Highly detailed and realistic, this Darth Maul bust stands 1' 5" tall.